This Flourless Chocolate Torte recipe is my “Go To” dessert. For no other reason than it is incredibly rich, moist, deeply chocolate-y and easy to make. You can top it with the Easy Ganache in the recipe, or simply dust it with powdered sugar. Serve it as it is, with berries, whip cream or with a scoop of ice cream. I will tell you, it is best served warm. A while ago, I was teaching a cooking class and someone asked: What is a torte? The main ingredients in a cake are sugar, eggs, butter, and flour. A torte uses little to no flour and uses ground nuts instead of flour. A cake rises higher and is lighter than a torte. A torte uses whipped egg whites gently folded into the batter to help it rise. Because of the gluten in the flour, a cakes’ texture is smooth and soft, whereas a torte’s texture is heavier and more coarse. Typically a torte (like in this chocolate torte recipe) has a deeper flavor and is richer than a cake. VARIATION: Instead of using coffee, add 4 oz of your favorite liquor. Spiced rum, Kahlua, Frangelico, and Grand Marnier are excellent choices. But with Valentine’s Day coming up, I thought, What the heck. 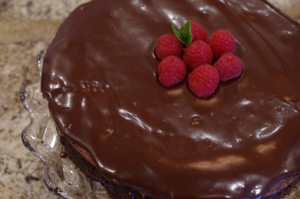 Let’s jazz it up with an easy chocolate ganache and raspberries! I know, I know… chocolate and raspberries are a Valentine’s Day cliche, but so what, it’s delicious. Think classic, not cliche. Many times tortes are served with berries because they’re light and have a fruity tartness to them that balances out the dense richness of the torte. Can a Flourless Chocolate Torte be Frozen? This recipe freezes great. To make serving it easy after freezing, cut it into individual slices before you freeze it. Wrap each piece in wax paper and then plastic wrap. When you are ready to thaw it out, unwrap the piece and microwave it for 30 seconds, then 10 second intervals until your desired temperature is reached. If you think this chocolate torte recipe looks good, check out this little collection of low carb and/or gluten free desserts that are to die for! In a double boiler, melt chocolate, butter, rum and kahlua. Stir until smooth. Remove bowl from heat and stir in sugar and then ground almonds. Let cool and stir in egg yolks. Beat egg white until stiff peaks and fold into chocolate. Bake until firm about 1 hour. Melt all ingredients in saucepan. Let cool slightly and pour over cooled torte. Serve warm with whip cream and berries.